With only three keepers, Brandon R. Gaylor still won the Toyota Tundra Bassmaster Weekend Series, operated by American Bass Anglers, Tennessee East Division 4 tournament, held April 13, 2013, on Watts Bar Lake. Running out of Tom Fuller Park in Rockwood to fish the 39,000-acre Tennessee River impoundment between Knoxville and Chattanooga, the Oliver Springs, Tenn., angler caught three bass weighing 13.46 pounds. He anchored his bag with a 5.24-pounder that earned the tournament big bass title. For the Boater Division victory, Gaylor took home a check for $1,912 plus another $180 for the big bass. In second for the boaters, Jack Dunaway of Kingston, Tenn., brought in four bass going 12.43 pounds. He anchored his catch with a 3.89-pounder to pocket $956. Hensley Powell of Whitwell, Tenn., scored a five-bass tournament limit for 11.92 pounds. He collected a check worth $637. 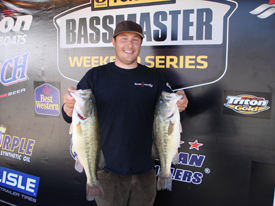 In fourth place among the boaters, Chris Whitson of Louisville, Tenn., landed three keepers going 11.17 pounds. Rogne Brown of Hixson, Tenn., followed with a five bass limit for 11 pounds. In the Co-Angler Division, John E. Sanchez of Friendsville, Tenn., won with three bass at 14.07 pounds for a 4.69-pound average. He upped his average by catching a 5.23-pound kicker that led the division big bass contest. For the victory, Sanchez collected $929 with an extra $88 for the big bass. John H. Cochran of Bryson City, N.C., finished in second with a three-bass division limit for 11.35 pounds. He capped his catch with a 4.23-pound kicker, earning $465. In third for the co-anglers, Harold Parsons of Knoxville, Tenn., found two keepers going 9.56 pounds. One of his fish weighed 5.08 pounds. He collected $310 for the effort. John Carpenter of Signal Mountain, Tenn., landed in fourth place among the co-anglers with two bass at 8.18 pounds including a 4.16-pound kicker. Barry Brown of Rockwood, Tenn., landed a three-bass limit for 8.12 pounds and fifth place. For more information, call Billy Benedetti, tournament manager, at 256-230-5632 or ABA at 256-232-0406. On line, see www.americanbassanglers.com.